Using Management Studio, you can get a list of Non-Default Configuration settings that have been set for your SQL Server Instance. In Management Studio, navigate to Object Explorer, right-click on the Instance name, select Report, select Server Dashboard. 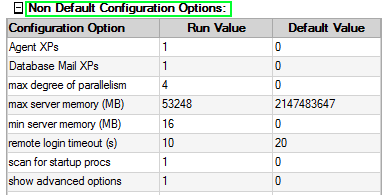 Within this report, navigate to the section titled "Non Default Configuration Options".